This is an amazing deal. Use the code saveon40 and it will take £4.50 off the advertised price. On top of that, you have 7% Quidco, which you can pretty much count on as they are touting the code on their site. Just been on the YSL website and worked out this lot would cost £76.92 if bought seperately. 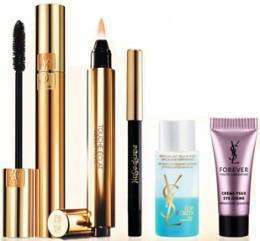 Yves Saint Laurent Touche Éclat is the UK’s No.1 Luxury Face Make-Up Product. * For instant light, luminosity and radiance. Light falls in love with the skin, banishing darkness & signs of fatigue and adding instant radiance. The must-have pen of makeup artists, Yves Saint Laurent Touche Éclat is the one beauty essential no woman should ever be without. *NPD UK: unit & value sales for 13 months ending Sept 2012, excl eyes and lips. For a false lash effect with buildable volume, discover the beauty of glamorous lashes with Yves Saint Laurent Luxurious Mascara for a False Lash Effect. The secret? A brush that has been specially designed to amplify the performance of its formula. Your eyes look intense and glamorous. With even one sweep of the wand and its unique formula, this mascara adds intense volume and definition to the appearance of lashes. Refreshing and non-greasy eye cleansing lotion dissolves all make-up, even waterproof and long lasting, without leaving an oily film on the skin. This bi-phased lotion has two phases within it that are shaken to combine before each application. The formula includes a clear upper phase to wipe-off impurities and resistant pigments of waterproof and long-lasting make-up while the aqua, bluish coloured lower phase wraps the skin in a pleasant freshness and sensation of softness. This versatile waterproof eye pencil is your make-up bag essential! The supple yet firm texture enables Yves Saint Laurent Long-Lasting Waterproof Eye Penci to be used as an eyeliner, kohl or eye shadow. An eye pencil that creates a sophisticated, long-lasting look in the blink of an eye, its highly pigmented formula delivers lasting colour in a velvety texture that glides on smoothly and precisely. The built-in blending tip allows you to achieve multiple effects—from a precise eyeliner to a smoky eye shadow to a dramatic kohl look. EDITED: to change the price after the 121212 code expired. I've been searching for deals on YSL for weeks... Bought something else in the end so now I'm gutted!! Gritted heat. Brilliant, thank you! Heat added. I've been searching for deals on YSL for weeks... Bought something else … I've been searching for deals on YSL for weeks... Bought something else in the end so now I'm gutted!! Gritted heat. Heat added....I bought this last week! Brilliant. That's another present sorted. Love the deals but hate how much it ends up costing you? How is this website? they have pretty poor reviews. Used them a few times. No problems at all. What shade is this please? Many thanks. This is Hot Stuff! Comes in a gold YSL cardboard box with a black 'velvet' pull out tray. Not lavish packaging but nice enough to make a good gift.